Wallpaper is not what it used to be. Silks, watercolor, woven textiles, and the most unique materials are finding their way to the walls and their effect? Perfectly subtle and a little wild. Uniquely gorgeous prints like this Schumacher wallpaper above have allowed our clients to be daring in their design. This Cambridge, MA powder room ignited with life and a little drama upon installation of this print. The way bold wallpaper reflects in a tight space, like a powder room, can create quite a brilliant illusion of space and light. The point of wallpaper is to get it right. Without fear of the "pain" putting up wallpaper can be, our clients certainly did. 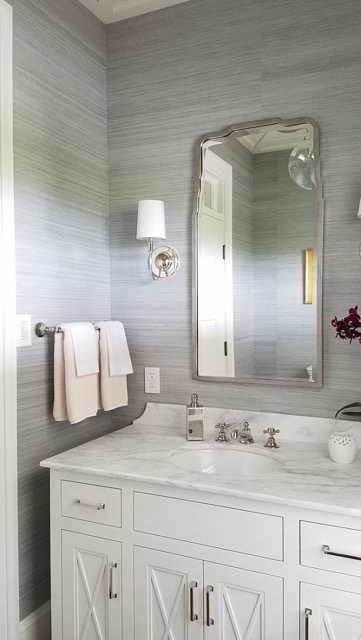 Powder rooms are often where we use wallpaper the most. Reason being, woven wallpapers add a lot of texture without being too loud. Their popularity has allowed the options for woven wallpapers to transform over the years from only grass cloth to an array of silks. 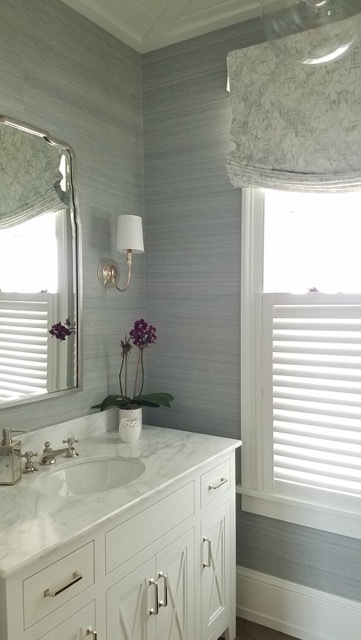 We used the grey version of Phillip Jeffries, Manila Hemp wallpaper in this Sudbury powder room. A favorite of ours and some of our clients, we've been able to use this pattern in a variety of projects. It's been put up on feature walls behind the bed in Master Bedrooms, and recently, in a Study room in Nantucket. Phillip Jeffries, Manila Hemp in Grey. If the installation is done right by using the correct primer as a base, wallpaper doesn't have to the pain it once was to remove. Although I do recommend hiring a professional, the risk is worth the reward. That being said, I'll admit, we use wallpaper in small doses but never meet clients without bringing a few samples that wow. It's my job as a designer to take the worry away from the "what if" when they want to change their style up. Challenge accepted. Take a look at how we've used wallpaper in different spaces below. Try it in your own space. Don't let the legacy of labor wallpaper once had change your mind. There are tons of manufacturers that are leading and continuously innovating the market that we know you'd love. Feel free to comment below for recommendations on manufacturers we use and admire. B and I have been going to Vermont after Christmas for the past few years for a long weekend. Instead of actual gifts, we give ourselves a trip. It's been great. We don't have to worry about what the other person bought and making sure our gifts are equally great. This year we stayed at Hotel Vermont in downtown Burlington. It's the new hip hotel -- and from what I could tell -- the place to be seen. Although we didn't try either of their restaurants this year, they were packed every night with people enjoying the food, libations and live music. Next time! Everyday, all day, the lounge by the lobby was filled with people enjoying hot chocolate and local beers by the fire. It was quite the cozy spot to rest and warm up by the fire after being out in the Vermont winter. The rooms were really well designed. I especially like the divided bathrooms; it was a cool concept. On one side of the entry was the shower and sink room, and on the other side was the toilet and second sink side. I thought it was a creative use of the space and gave us both our own sink -- who doesn't love that? Both 'rooms' had the same sliding doors but the shower room had two sliding doors closing it off. I loved the way it opened up the room. I also liked all the finishes they used and they mixed it all together so well. It looked effortless but I am sure someone spent a lot of time working on those schemes. In the room was a book about how everything came together with bios on all the local artisans who worked on the project. The desk in the room (almost) made me want to get some work done. They even had a note book with graph paper... such cute touches. Instead of work, though, we opened a bottle of wine and got ready for dinner. Have you stayed at Hotel Vermont? If so what did you think about it? Does anyone have any other great hotels to try in Vermont?